Sabino horses have a pattern of white patches accompanied by splashes, spots and ticking. Sabino (pronounced sah-bee-no) can range from very minimal white to sabino white, where white covers almost the entire body. Most sabinos have flecks or roaning, especially those with extensive white. This roaning may not be present at birth, but can develop as a horse matures. White marking on the face is a common characteristic of sabino. This might only be a few white hairs, but sabino horses are well known for often having extensive white markings, from a large blaze to “bonnet”, "apron" or “bald” faces. Sometimes there is white on the sides of the face leaving dark where a blaze might be, giving a “badger face” pattern. There is commonly some white on the chin and/or lower lip. Leg white is also common among sabino horses and may affect all four legs, ranging from coronets to high stockings. There can also be white patches on otherwise colored knees. Most sabino horses have lacy, speckled patches on their bodies with many tiny flecks of color or white near the edges. There are often roaned or speckled spots within larger patches. Sabinos are regularly classified with overos and are sometimes referred to calico overo. They are also often confused with roan. The term sabino means "pale red" or sometimes "roan" in Spanish. However sabino is genetically distinct from both overo and roan, is caused by different genes and not associated with lethal white overo syndrome. Also sabino can occur with any coat color and is not confined to chestnut. Sabino occurs in many breeds including Thoroughbreds, Arabians, Akhal Tekes, Tennessee Walking horses, Spanish Mustangs, Quarter Horses, and Morgans. In fact there are few breeds in which Sabino is absent, Icelandic Horses being one. Some breeds such as the Gelderland are almost exclusively sabinos, having the large facial white, chin-spot and high leg white. 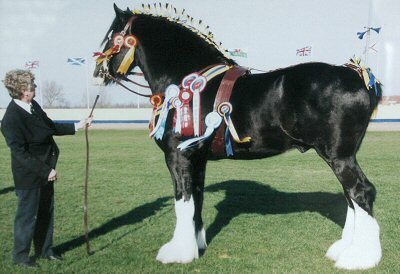 Shires and Clydesdales are exclusively sabino, though the markings may be limited to white face and leg markings. Minimal sabino may occur as roaning, speckled areas or larger white patches. Minimal sabino horses may only have a white chin, a few belly spots or a low jagged-edged sock – they do not look like a pinto. It is quite probably the case that the sabino genes are actually responsible for the normal white markings on the legs and faces of many horses (such as socks, stockings, stars and blazes). Minimal sabino is a common source of so-called "crop-out" pinto horses from supposedly solid-colored parents. This can be a problem for Quarter Horse breeders since there are minimal expression sabino quarter horses that can and do produce full patterned paint foals, as for example, the beautiful stallion Our Sir Prize. Until recently such quarter horses were not allowed to be registered as quarter horses, even if both parents were registered as such! Sabino horse may sometimes be almost entirely white, a phenotype called sabino white. Any color that remains is usually as roaning or speckling on areas such as the ears, tail base, chest and flanks. Sometimes there is no colored hair, but just colored skin showing through white hair. White sabinos occur in Tennessee Walking horses and are getting more common in the American Paint Horse. Aspen is a beautiful sabino white Tennessee Walking Horse mare, with dark eyes. She's by a Pusher Busting Loose stallion and out of a Dejà Blu - Mack K's Handshaker-bred mare. Aspen is homozygous for the sabino-1 allele. Many thanks to Mary Ellen Areaux of Walkers West, Kaufman, TX for sharing this photo of her lovely mare. Like dominant white the sabino-1 spotting pattern is caused by a mutation in the KIT gene (Brooks and Bailey, 2006). It can therefore be considered allelic with it. Complete linkage was observed between this allele SB1 and the Sabino 1 phenotype in Tennessee Walking Horse families. Five white horses were tested and shown to be homozygous for the sabino-1 allele, showing that homozygosity for SB1 results in a completely, or nearly completely, white phenotype. It seems likely that some horses thought to be carrying the "Dominant White" gene were, or are, in fact sabino horses showing the extreme form of sabino white. White horses born of non-white parents are probably usually sabino horses with the maximum expression of the pattern. The gene is acting semi-dominant, with homozygotes showing a more extreme phenotype than heterozygotes. It is also noted that sabino is not homozygous lethal, although some, dominant white mutations are. 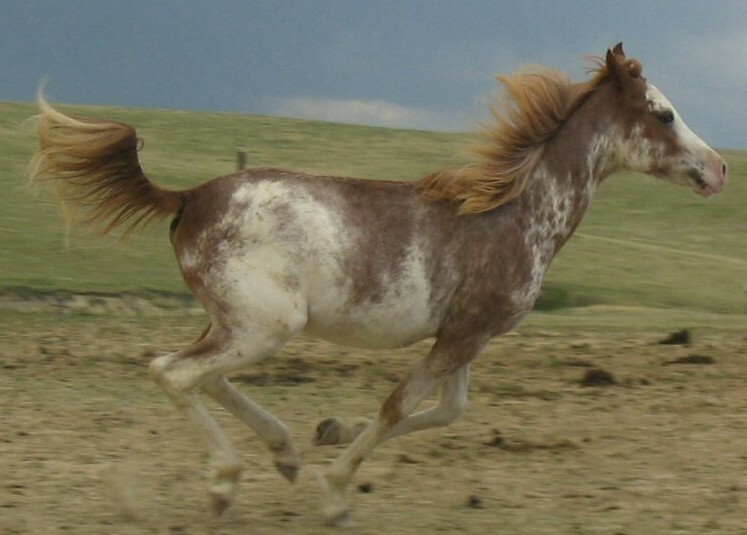 Another 68 heterozygous horses either showed the sabino phenotype or were multi-patterned, due to the additive effect of other white spotting patterns. Thirteen horses with other sabino-type patterns did not have the sabino-1 mutation, indicating the polygenic and phenotypically variable nature of sabino patterning. Blue eyes may sometimes occur in sabino horses, but are not considered to be characteristic of the type. Certain lines of horses exhibit blue eyes, such as the Khemosabi line in Arabians, though often only one blue eye is present. Probably blue eyes is linked to sabino in these lines, being caused by a separate gene that is often inherited with the sabino gene. The genetics of sabino horses involves at least two genes.